The modern health physicist must be prepared to review, interpret, and analyze statistical data. The use of statistics and emphasis on risk-based decision-making has become more and more important to the radiation protection community. 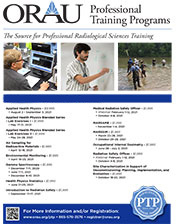 To help meet the need for trained personnel in this area, ORAU conducts a five-day training course—Health Physics Statistics. The American Academy of Health Physics grants 40 Continuing Education Credits for completion of this course. This five-day course introduces participants to the use of statistics in operational health physics. The course is divided between lectures and practical laboratory activities designed to reinforce important principles. Core concepts such as probability distributions, descriptive statistics, and hypothesis testing are included to support more detailed discussions on uncertainty propagation and statistical tests. This course is for individuals with limited statistical knowledge and/or practical work experience who must analyze data sets and/or must oversee health physics projects.